Is the offer in force?In AP Edition dt.August 10th. similar offer is made.Is the offer in force? iTS AMAZING THAT COMPANIES LIKE GIVE FAKE ADVERTISEMENTS. 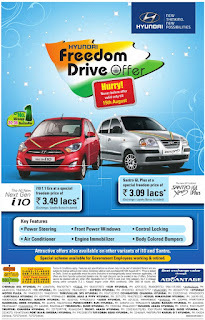 wE HAPPENED TO SEE THIS ADVERTISEMENT AND WENT FOR EXCHANE OFFER WITH MARUTI.FIRST OF ALL THERE IS NO SUCH OFFER AND ONLY WASTE OF TIME. SECONDLY MY CAR WAS INSPECTED ALONG WITH DOCUMENTS AT ONE OF THE DEALER AND THE AGREED PRICE FOR THE WAS RS.90,000 FROM SELLING PRICE.AND THE CONFIRMAION WAS GIVEN TO SETLLE IN 2 TO 3 DAYS. AFTER 2 DAYS WHEN I ARRANGED FOR THE EVERYTHING THEY NEGLECTED TO EXCHANGE AND I WAS TOLD THAT I WILL BE PROVIDED WITH 30K AMOUNT. THAY SAY EXCHANGE BONUS AND LOYALTY BONUS WHICH IS ALSO WRONG BECAUSE WHEN TIME COME TO PROCEED THEY START SAYING THIS NOT FOT THIS MODEL BUT FOR OTHER MODEL.